Citation Information: JCI Insight. 2017;2(17):e93343. https://doi.org/10.1172/jci.insight.93343. Heart disease remains the leading cause of death worldwide, highlighting a pressing need to identify novel regulators of cardiomyocyte (CM) function that could be therapeutically targeted. The mammalian Hippo/Tead pathway is critical in embryonic cardiac development and perinatal CM proliferation. However, the requirement of Tead1, the transcriptional effector of this pathway, in the adult heart is unknown. Here, we show that tamoxifen-inducible adult CM–specific Tead1 ablation led to lethal acute-onset dilated cardiomyopathy, associated with impairment in excitation-contraction coupling. Mechanistically, we demonstrate Tead1 is a cell-autonomous, direct transcriptional activator of SERCA2a and SR-associated protein phosphatase 1 regulatory subunit, Inhibitor-1 (I-1). Thus, Tead1 deletion led to a decrease in SERCA2a and I-1 transcripts and protein, with a consequent increase in PP1-activity, resulting in accumulation of dephosphorylated phospholamban (Pln) and decreased SERCA2a activity. Global transcriptomal analysis in Tead1-deleted hearts revealed significant changes in mitochondrial and sarcomere-related pathways. Additional studies demonstrated there was a trend for correlation between protein levels of TEAD1 and I-1, and phosphorylation of PLN, in human nonfailing and failing hearts. Furthermore, TEAD1 activity was required to maintain PLN phosphorylation and expression of SERCA2a and I-1 in human induced pluripotent stem cell–derived (iPS-derived) CMs. To our knowledge, taken together, this demonstrates a nonredundant, novel role of Tead1 in maintaining normal adult heart function. Tead1 ablation in adult cardiomyocytes leads to acute diminished cardiac contractility. (A) Experimental procedure and tamoxifen diet protocol for inducing CM-specific Tead1 KO (Tead1-icKO). (B) Tead1 protein expression in the heart ventricles. GAPDH, loading control. TM, tamoxifen. (C) Ejection fraction, (D) fractional shortening, (E) left ventricular internal diameter at end diastole (LVIDd), (F) left ventricular internal diameter at end systole (LVIDs), and (G) relative wall thickness (RWT) by echocardiography (Echo) at 6 weeks after starting TM diet. Values are shown as mean ± SEM. ***P < 0.001; data were analyzed by 1-way ANOVA with Tukey’s post hoc test. 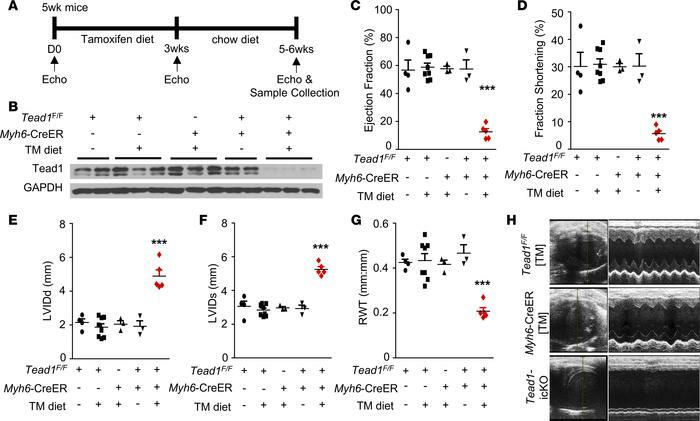 Comparisons between Tead1-icKO mice (n = 6–8) and TeadF/F chow diet mice (n = 4), TeadF/F TM diet mice (n = 8), Myh6-CreER TM diet mice (n = 3), or TeadF/F;Myh6-CreER chow diet mice (n = 3) were statistically significant. No significance was present among the four control groups. (H) Representative 2-D M-mode images of the left ventricle from Echo assessment of the TeadF/F TM diet, Myh6-CreER TM diet, and Tead1-icKO mice at 6 weeks after starting TM diet.